Now that we are aware of the hours at Boulevard we actually showed up when they were open, and on a Friday. The three spots out front were filled but we discovered more parking around the back. We were early for dinner but had class to get to so we found a mostly quiet space with a few blue-cotton-topped diners rotating in and out. The bartender was covering the whole place and told us we could plop down where ever we preferred. It’s fairly classy inside with a long wooden bar down one wall, booths on the opposite and a small sea of tables and chair separating the two. You know a place has a steady stream of regulars when they ask if you need a menu without bringing one…the expectation is you’re going to say no. Having heard a good bit about their fish (Fridays only, we lucked into that) I expected pretty standard bar fare and was surprised to find a very middle eastern menu with some burgers and sandwiches tacked on. The menu isn’t extensive so we opted for familiar with one new little treat I had not tried prior, Moroccan cigars. The familiar consisted of hoummous, shish kebab and the special fish. It seemed as though moments after the dishes were ordered they were traveling towards our table, scary fast service. The hoummous arrived. It was enormous, we took almost all of it with us. 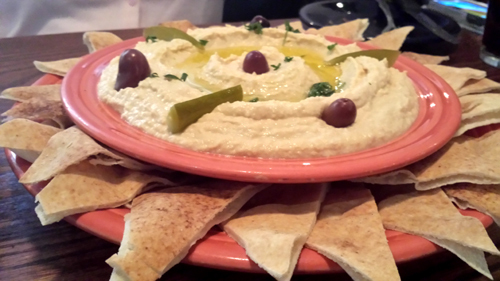 Loads of pita ringed a bowl filled with a classic, earthy garbanzo bean and lemon puree, studded with sharp and pungent olives and a moat of olive oil. It’s a lake of classic fare. 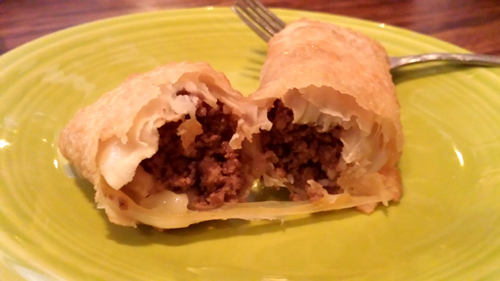 The cigars are sort of like middle eastern fried spring rolls, stuffed with ground beef, tomato and spices. Precisely Paired With Warm Savory "Cigar"
Mildly spiced and tasty the hot “cigars” were nice enough on their own but are served with a cucumber yogurt sauce. Less pungent than a tzatziki sauce, it was served chilled but the combo of the veg and the yogurt resulted in a cold that a fridge just can't provide and made for a terrific foil for the hot savory wraps. 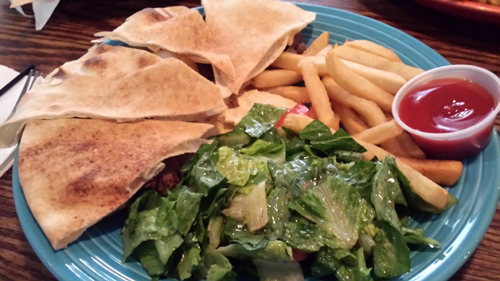 The shish kebab arrived with more hoummous, pita and fries and a salad. The fries were pretty basic, done well. The salad consisted of a dark green lettuce with cucumbers and tomatoes. There were options as far as dressings and we went with the house which was a light and bright vinaigrette, if the steak had not been as tender and beefy, the salad would have easily been the best thing on the plate. 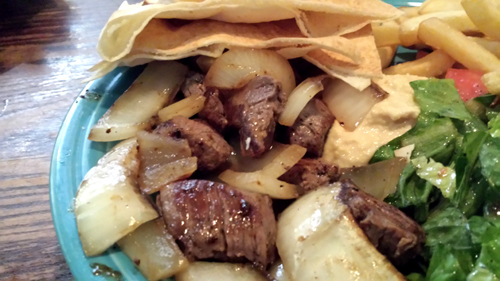 The steak was tenderloin, done to a perfect mid-rare and wrapped in pita with a little hoummous, loads of grilled onion and the lightly dressed salad was delicious. Had there not been fries I would not have missed them. The Friday only perch dinner comes in three or five filet varieties, we heard it was good and went with the five, that was before the hoummous arrived. 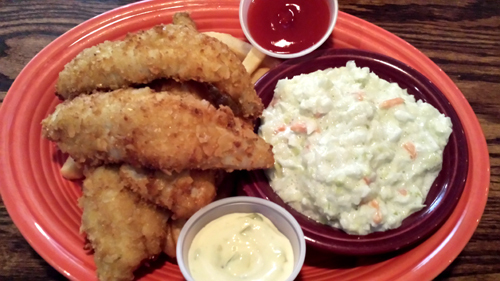 Fish came with the same fries, cole slaw, and tartar sauce. The slaw was a pretty average creamy cabbage melange. The breading on the fish looks thicker than it is. 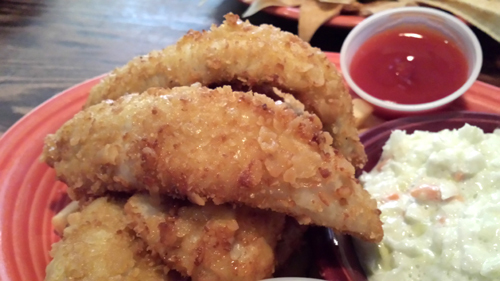 It is light and just crispy which is a plus when the fish is really fresh, which it is. Fried to a steaming hot but still juicy flake, it was not a surprise that as more folks started to trickle in more plates of fish headed out. The tartar sauce was also just a bit unique. Instead of the standard mayo/pickle there were other flavors involved. The fish was good enough it didn’t need the tartar sauce. I usually save that for more poorly done fish, but it really added something to the filets. It was good for more than just covering up ammonia or adding lubrication for over-frying. As the business picked up our service got even better, they knew when we were done, they brought well thought out packaging for the pile we couldn’t eat and got us on our way. 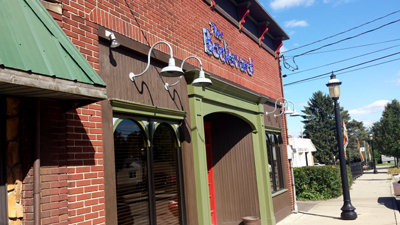 The Boulevard Tavern was better than I had expected. 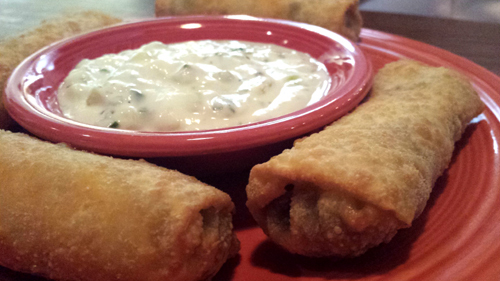 There isn’t much else to try on the menu but what they do, they do well.